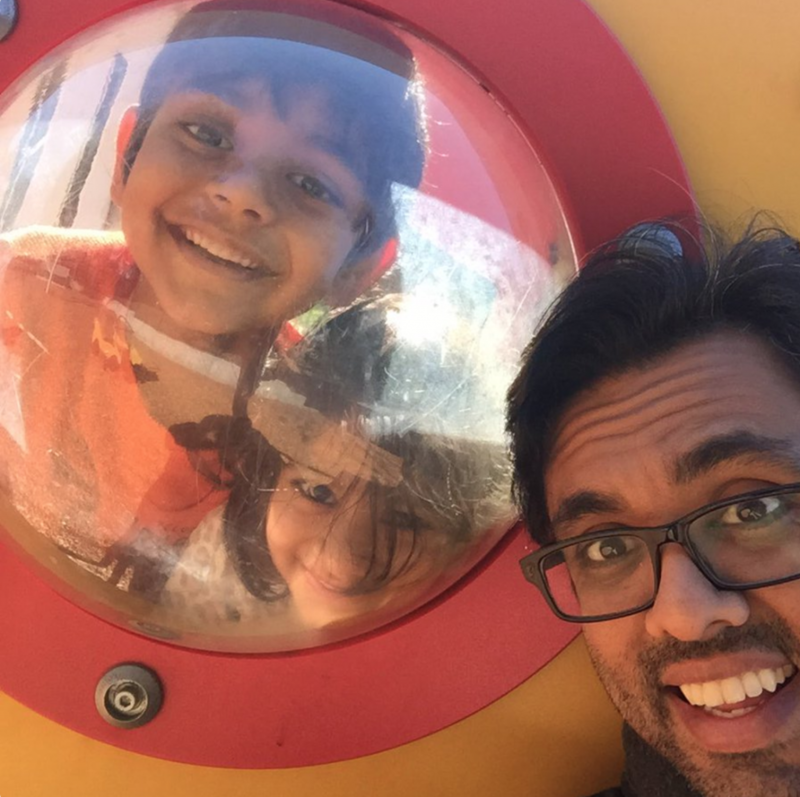 Hiten Shah joins the podcast. He needs no introduction for those in the startup space. He has built the following companies and is a father of two young children. He has started three SaaS companies, Crazy Egg and KISSmetrics and Quick Sprout. One is venture capital backed & the others are self-funded. Find Hiten at the links below…. – Started a bunch of online businesses starting in 2003. – I have a 7 year old son and a 3 year old daughter. – Online businesses for 14 years, and have had kids for the last 7. How did your world change when you became a father? – It didn’t change that much. I’m pretty good at time management. It provided a new priority that trumped all business priorities. – My business doesn’t have an office, teams are mostly independent, so the way I’ve run my businesses has a lot of flexibility. We’ve always had people traveling and spending time with their kids. – When you’re in school you’re told when to go to different classes, when to take breaks, when to eat, and those constructs have been carried over to companies. But that’s not how we’ve thought about it. We still have high standards and get things done, but with flexibility. – When I had kids, we already had this culture in our companies. So there’s an ability to have a high growth work environment with flexibility. – I didn’t say that I don’t work 80 hours a week. It’s not about the 80 hour weeks, it’s more about the flexibility than your time. – I probably work more than many of your guests, but I don’t count my hours. So how do you balance where you spend your priorities? – People really believe that you have to spend time with your kids all the time…I just focus on the quality of the time. Working with teams in my companies and figuring out how to leverage my time, I do the same thing with the kids. – When I’m there I’m present, and I’m focused on what I’m doing with the kids. Being present is more important to me than spending a certain number of hours with my kids. – I’m not saying this will work for anyone else. I spend a lot of time working, but I don’t think kids get in the way of that. In the last year or so, I don’t watch TV or movies. My kids have no ipads anymore. These screens make you spend time that are not enabling you to communicate with the people you care about. – Cutting out screens helped me with my attention, so when I spend an hour with my kids it’s not spending 3 hours with them watching a show. – So you’re saying I’m going to cut out all the crap, and make the time that I do have with my kids more valuable. I don’t really believe in the word balance. It’s something we’ve made up. The second you think of it as balance then you see those scales. It’s not about quantity of your time, it’s about the quality. Has your wife ever said that you’re not spending enough time with us? – My wife and I have been dating since we were 15, and we’ve always known this about each other. We’ve never had a problem. – She works with all the businesses too. We work. We don’t have many other things we do. – I don’t think other people can necessarily relate to this. – We’re not happy if we’re not working. We know how to support each other. – Every weekend I work from home, no matter what. I don’t have too many in person meetings on the weekend. So if we want to do something as a family, weekends are the best time. – It’s not about having balance in time, it’s making sure you’re balancing your relationships. My wife works from home 7 days a week, but she has those relationships with the kids. – I always do my best to be home for dinner on a friday night and one other time a week if I can. That’s just the way it is. If someone is playing the opposite side, they can label you a workaholic. It sounds like you keep that in check by saying it’s really about the relationships. – The worst thing I’ve done to them is take away the ipads. Outside of that everything is great. DHH said give the kids the ipads and they’ll figure out their own limits. So it sounds like your work is your hobby, and you and your wife have the same expectations. – I don’t have that transition of reevaluating. But everything just boils down to communication. If you’re going to have a change in your life, and someone’s going to be affected by that then you need to be responsible for that change. And then you need to talk to your partner about it. And if you can’t have that conversation, then don’t do it. Your relationship with your partner can’t be adversarial. – I just really value communication and brutal honesty, and setting expectations together. – I grew up with it, my father was good at it. – As I got into the business world, it seemed like that’s what solved all problems. If you feel it, then you need to say it. If you don’t set expectations together then people get off base. – In most cases if I communicate what my needs are, things tend to be better regardless of how abrupt or different they are. What are you doing from an education standpoint to keep your kids adapting to a changing world. – I don’t like the word “try.” I told my kids why I don’t like that word and why I don’t think it should exist in his vocabulary. I also believe in mimicry. Trying to be a good example for my kids for how to treat people. – As far as education, I went through formal education, but I don’t put a lot of weight on it. My kids are self taught and they will continue to be self taught. I don’t want them to rely on something like school. Every founder I meet is self taught in some capacity, and I want that for them. – I’d rather teach my kids things like this than worry about whether my daughter can write yet at 3. – There’s more time to learn formal things, but not as much time early on to learn these basic principles. – My dad never told me what to do or got upset with me. What he did do, was he was a great example of how he would want me to be when I grew up. He would tell me stories of his life and what he’s done. I think as my children grow up, there will be stories from my dad and me and my wife about what we’ve been through. I think there’s so much to learn from that. It seems like a lot of education doesn’t emphasize those soft skills. I think you can always make up the hard schools if you aren’t learning them by a certain age. Do you have anything else to say? – I think we forget that you have relationships with coworkers, with your significant others, and your relatives, and the relationship you have with your kids is not much different. You’re building a relationship with your kids and it’s not that different.